Kate Middleton goes casual for Bhutan hike | HELLO! With a six-hour trek ahead of her the Duchess of Cambridge, née Kate Middleton, opted for comfortable and easy-to-wear gear. 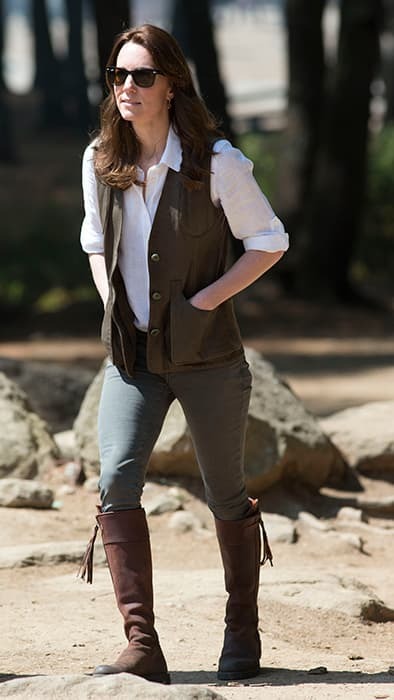 But the ever stylish Kate managed to make casual look chic as she began the gruelling hike in Bhutan. William and Kate were heading to the Tiger's Nest monastery, which is perched 3,000 metres up a mountain. It is located close to the cave where Guru Padmasambhava – who is credited with introducing Buddhism to Bhutan – is said to have meditated for three years, three months, three weeks and three days in the eighth century. The pair were no doubt excited to be trekking to the spiritual place and didn't seem put off by the five to six-hour hike ahead of them. When William's father Prince Charles visited Bhutan in 1998, he made the same ascent and even painted a watercolour scene of the Tiger's Nest. The Cambridges arrived in Bhutan on Thursday, having flown in from India where they spent the past four days. Royal fashion fans have been on tenterhooks, waiting to see what Kate will step out in each day of her tour. The Duchess has so far not disappointed, showcasing a range of colourful and on-trend outfits. Thoughtful Kate has also been conscious of wearing brands and designs that pay tribute to her host countries. On her first night in India, she debuted an elegant sari-inspired look at a Bollywood gala held in her and William's honour.